Resep original pam cakes ini berasal dari Southern Living, luar negeri. Makanan ini sangat digemari disana dan menjadi makanan tambahan saat ada acara spesial. 1. Stir together flour and next 4 ingredients in a large bowl. Whisk together buttermilk and eggs; gradually stir into flour mixture. Gently stir in butter. (Batter will be lumpy.) Let stand 5 minutes. 2. 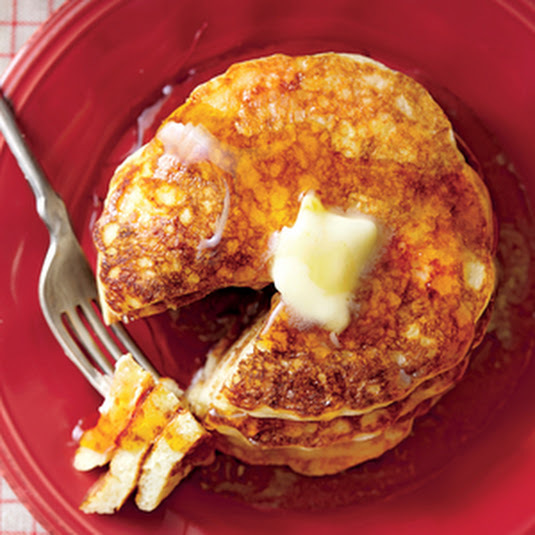 Pour about 1/4 cup batter for each pancake onto a hot (350°) buttered griddle. 3. Cook pancakes 3 to 4 minutes or until tops are covered with bubbles and edges look dry and cooked. Turn and cook 3 to 4 minutes or until golden brown. Place pancakes in a single layer on a baking sheet, and keep warm in a 200° oven up to 30 minutes. Chocolate Chip-Toasted Pecan Pancakes HANDS-ON 35 min., TOTAL 40 min. Add a generous dollop of whipped cream for an unexpected dessert. Prepare recipe as directed in Step 1. Pour about 1/4 cup batter onto a hot (350°) buttered griddle, and sprinkle each pancake with 1 Tbsp. dark chocolate chips and 2 tsp. finely chopped toasted pecans. Proceed with recipe as directed in Step 3. Top with powdered sugar and shaved chocolate. Makes about 20 pancakes. Itulah resep makanan original pam cakes dari luar negeri. Semoga menjadi inspirasi ide dalam mencari makanan yang dibuat sendiri.